Disney Publishing Worldwide (DPW), formerly known as The Disney Publishing Group and Buena Vista Publishing Group, is the publishing subsidiary of Disney Parks, Experiences and Products, a subsidiary of The Walt Disney Company. Its imprints include Disney Editions, Disney Press, Kingswell, Freeform, and Hyperion Books for Children. It has creative centers in Glendale, California, and in Milan, Italy. In 1990, Disney Consumer Products discontinued its license for Topolino, an Italian Mickey Mouse magazine. This led Michael Lynton, the Disney Consumer Products business development director, to start up its own Magazine Group with the similarly outlaid Disney Adventures. 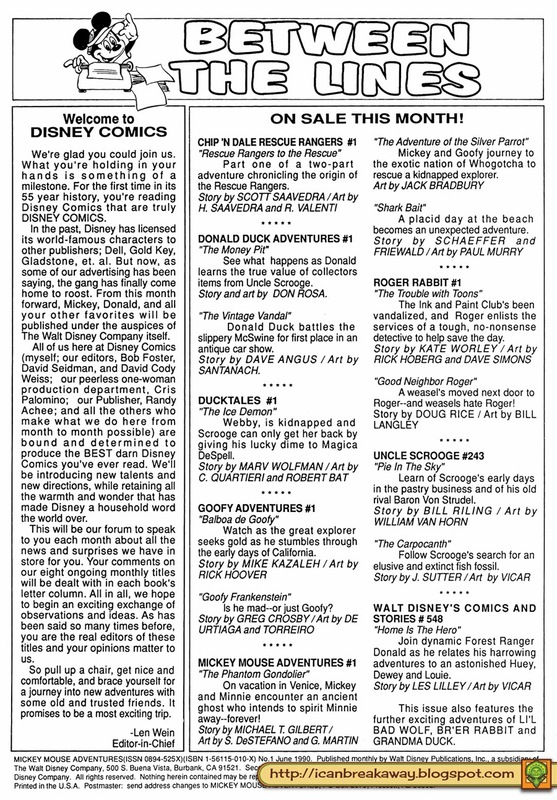 Through Walt Disney Publications, Inc., Disney Publishing launched Disney Comics in the United States. That same year, Disney began publishing Disney Adventures. In 1991, Disney Publishing purchased Discover magazine from Family Media, placing it within its Magazine Group and purchased the FamilyFun Magazine after its second issue from Jake Winebaum. The Disney Publishing Group (DPG) was incorporated in January 1992, and included the already formed Hyperion Books, Hyperion Books for Children, Disney Press and its units. In 1994, DPG launched the Mouse Works and Fun Works divisions in February and November, respectively, in order to publish interactive children books. By April, the Magazine Group agreed with Ziff-Davis Publishing Company to a joint venture publication, Family PC, to be launched in September. In June, Lynton left his position as senior vice president of DPG to become president of Disney's Hollywood Pictures. In March 1995, with the market too crowded with Disney books, DPG merged Hyperion Books for Children with the Disney Press units. In August, Disney Magazine Publishing was reorganized into three divisions, each headed by a vice president/group publisher: Disney Family Magazines, Disney Kids Magazines, and Disney Special Interest Magazines. Family Magazines and Special Interest Magazines were expected to acquire additional publications beyond their single titles, Family Fun and Discover respectively. Special Interest Magazines' publisher was assigned responsibility for the Discovery Channel TV show, Discover Magazine. Kids Magazines included the newly developed Big Time weekly newspaper supplement to have a Fall 1996 launch. Magazine President Jake Winebaum was transferred to head up Disney Online. On May 11, 1998 Disney Publishing was renamed Buena Vista Publishing Group. In April 1999, Buena Vista Publishing Group changed its name to Disney Publishing Worldwide, Inc. (DPW) with Hyperion Books transferred to Disney's ABC Television Group. Disney Publishing launched its first original comic book, W.I.T.C.H., in 2001. It was successful, selling one million copies per month by August 2004, and was adapted into an animated series. In mid-2001, DPW and Baby Einstein (which Disney acquired later that year) agreed to publish a baby book line to introduce fine art, foreign languages, poetry, and classical music. Gemstone Publishing licensed the rights to publish Disney comics from DPW beginning in June 2003. Following its collapse in June 2004, the CrossGen trademark and properties were purchased by DPW's educational publishing division that November for its reading aids, with additional publications based on CrossGen books. The Disney Consumer Products' Disney Fairies franchise debuted in September 2005, when Disney Publishing unveiled the novel Fairy Dust and the Quest for the Egg paired with a virtual world. The first book in The Kingdom Keepers series, based on Disney Parks, was released August 29, 2005. In 2005, Discover Magazine was sold to Bob Guccione Jr. and the Disney magazine was shut down. In February 2006, Wondertime magazine, which focused on mothers of children up to age six, was launched. DPW licensed out CrossGen to Checker Publishing Group to reprint comic book series as trade paperback editions starting in February 2007. In February 2007, Disney merged its kids and family focused television, online, radio, and publishing businesses' advertising sales and promotion teams into Disney Media Advertising Sales and Marketing Group, all of which were overseen by the presidents of Disney Channels Worldwide, Walt Disney Internet Group, and DPW. DPW canceled Disney Adventure with its November 2007 issue. By 2009, Disney Publishing Worldwide was organized into three divisions: Global Book Group, Disney English, and Global Magazines with four revenue areas: Global Magazines, Global Books, U.S. Magazines, and Disney English. Disney Publishing launched Disney Digital Books on September 29 with five hundred books online. In 2009, Disney Press released Fairest of All: A Tale of the Wicked Queen, the first of the Villains book series written by Serena Valentino. Disney Publishing Worldwide (India), a division of Walt Disney Company (India), announced a licensing agreement in April 2009 with local publisher Junior Diamond to publish Disney comic books, in both English and Hindi. On December 8, 2010, DPW's India unit signed a multi-year contract with India Today Group to print and distribute Disney comics in India. With few books issued under the imprint, Marvel Worldwide and Disney Books Group relaunched the Marvel Press imprint in 2011 with the Marvel Origin Storybooks line. In November DPW announced a new publication, FamilyFun Kids, a bi-monthly magazine with kids' craft, games, puzzles, and recipes. In January 2012, DPW agreed to sell Family Fun Magazine to the Meredith Corporation. By September 2012, the White Plains, New York office was closed with staff being moved to Glendale; fifty sales and marketing staff moved to New York City to join editors there. In January 2013, DPW launched the Never Girls book series, an extension of the Disney Fairies franchise, with publishing partner Random House. With the June 2013 announcement of the Hyperion Books sale, Hyperion's adult trade book division was moved to Hachette Book Group. Books related to existing Disney–ABC Television Group properties, young adult titles, and Disney-Hyperion imprint and titles were transferred to DPW. By January 2014, the Kingswell name was selected as a placeholder imprint name for the Hyperion titles withheld from the Hyperion division sale; Kingwell Avenue was Disney's location before moving to Hyperion Avenue. Disney Publishing Worldwide transferred the Disney Fairies franchise main publishing license to Little, Brown Books for Young Readers in January 2014 except for the Never Girls series. DPW announced in April 2014 that Del Rey Books would publish a new line of canon Star Wars books under the Lucasfilm Story Group from September onward on a bi-monthly schedule while previous, non-canon, Expanded Universe material would be reprinted under the Star Wars Legends banner. Disney Publishing has been a focus for Disney Consumer Products to launch new franchises. In May 2014, DPW released the first book in the Waterfire Saga mermaid book series, along with a song and music videos. Disney's first deal with Stan Lee's POW! Entertainment resulted in The Zodiac Legacy book series, with the first novel released in January 2015 through DPW. The Never Girls chapter series reached the New York Times Best Sellers List - Children's Series on the week of August 10. Disney Learning launched its Disney Imagicademy program on December 11. At that time, DPW was organized into three main units: Core Publishing, Digital Publishing, and Disney Learning. Disney Consumer Products and Interactive Media (DCPI) was formed in June 2015 as merger of Disney Consumer Products and Disney Interactive with Disney Publishing Worldwide reporting to the co-chairs of DCPI. DPW launched Star Darlings, its first franchise under DCPI, on September 15, 2015 with two books. In October 2015, Disney Publishing announced the launch of the Freeform imprint to coincide with the relaunch of ABC Family as Freeform. This imprint was to be headed up by editor-in-chief and associate publisher Emily Thomas Meehan and would focus on young-adult and teen crossover fiction and nonfiction working with Freeform channel partners to develop new intellectual property from both developing and bestselling authors. The first book from Freeform was Two Truths and a Lie, written by Melissa de la Cruz and Margaret Stohl, and was the first in a trilogy. Disney-Hyperion started a new imprint, Rick Riordan Presents, for middle grade readers featuring mythology-based books by September 2016. Riordan would act as in a curator-type role and his editor, Stephanie Owens Lurie, would be editorial director of the imprint. The imprint was planned to be launched with two books in 2018. By April 2017, the imprint had acquired three titles for its 2018 launch with audio rights sold to Listening Library. Riordan Presents first book, Aru Shah and the End of Time, will be written by Roshani Chokshi to be published in April 2018 and will be the first in a quartet of novels. The other two, Yoon Ha Lee 's Dragon Pearl Korean folklore novel and Jennifer Cervantes’s Mayan based Storm Runner novel, will be stand alone novels released in September 2018. Disney Publishing launched unplanned franchises starting with W.I.T.C.H. in 2001. DPW's educational division purchased the CrossGen comic book assets in November 2004. DPW was then drafted as an outlet for Disney Consumer Products' planned franchises: Disney Fairies, Disney Bunnies (and their extensions), the Never Girls book series, and Disney Princess Palace Pets apps. DPW started to originate planned franchises with the Waterfire Saga in 2014 and The Zodiac Legacy and Star Darlings in 2015. CrossGen – purchased franchise in November 2004 for reading aids plus development of other assets by Hyperion Books for Children. Its Abadazad fantasy series was reworked as a prose/comic hybrid format releasing two volumes in June 2006 of a planned series of eight volumes, up from the original four. The franchise was restarted as an imprint by Marvel Comics in March 2011. Disney Villains - started as a book series written by Serena Valentino with the first release in 2009. Currently in the works as a TV series for Disney+, Book of Enchantment, as of February 2019. The Kingdom Keepers - a seven book series based on the Disney parks features holographic guardians fight against some of the Disney Villains called Overtakers. The first book was released August 29, 2005. Star Darlings - launched with two chapter books in September 2015. W.I.T.C.H. – launched as a comic book in 2001 and expanded with an animated series in 2004. Waterfire Saga – launched with the first novel of a tetralogy in May 2014. The Zodiac Legacy – expected franchise launched as a book series in January 2015. Waterfire Saga is a Disney Publishing franchise based on mermaids launched in May 2014 as a multimedia release around a core book series. The Waterfire Saga was developed by Disney Publishing's various departments after some years of considering doing a mermaid mythology project. A 200-page franchise bible was compiled that included cultures, story arcs, images of the undersea world and its inhabitants, and main character profiles. In the summer of 2011, Global Books' publisher Suzanne Murphy approached Jennifer Donnelly to write the book series. Donnelly agreed. In early 2014, Disney Publishing Worldwide announced the launch of the Waterfire Saga. By March 2014, Donnelly had already finished work on the first two books and had started on the third. The first novel, Deep Blue, was released under the Disney-Hyperion imprint on May 6, 2014 with a print run of 250,000 copies and a national book tour. The novel's marketing plan included advertising in print, TV, and in-theater; ABC Family and Hollywood Records would run additional promotions as well as a retail floor display with riser. A song and music videos were included in the simultaneous e-book edition release. The book was released simultaneously in the United Kingdom, Italy, and Spain. Other foreign editions were to be released in late 2014 and early 2015. The second book in the series, Rogue Wave, was released in January 2015. In 2015, DPW's Milan comic unit was scheduled to start issuing comics and graphic novels to expand the franchise. Dark Tide was released Summer 2015 and the final book, Sea Spell was released in Summer 2016. Merpeople came into existence after their ancestors' island of Atlantis was destroyed. The four-book series centers around six mermaids who try to save their world. Deep Blue initially focuses on Serafina, a mermaid of the Mediterranean Sea, who has a premonitory dream about an ancient evil returning on the eve of her betrothal. Her mother is hit by assassin’s poisoned arrow, which confirms the dream. She has additional visions that lead her to find five other mermaids across the world's oceans. The six bond and find a world threatening conspiracy. An audio book version of Deep Blue was recorded by Bea Miller released through Listening Library. In 2015, DPW's Milan comic unit was to begin issuing yet to be announced comics and graphic novels to expand the franchise. The song “Open Your Eyes” was issued through Hollywood Records, and is sung by Bea Miller. The Zodiac Legacy' is a superhero franchise created by Stan Lee that debuted in illustrated novels published by Disney Publishing with POW! Entertainment under the Disney Press imprint. Working with Stan Lee on the books are co-writer Stuart Moore and Andie Tong, artist. The first illustrated novel, The Zodiac Legacy: Convergence was released on January 27, 2015. The second novel in the illustrated series, The Dragon's Return, was released on January 26, 2016. Dragon's Return made the New York Times best seller list for the week ending January 30, 2016. With Papercutz, the first Zodiac Legacy graphic novel, Tiger Island, hit the stands on March 30, 2016 with the writing team joined by artist Paris Cullins. In early April 2017, the third and final book in the trilogy, The Balance of Power, was released. By that time, a second Papercutz graphic novel in the series was released with art from P.H. Marcondes. In July 2017, the third graphic novel was released. Plot: The series follows a Chinese-American eighth grader from Philadelphia going on a Hong Kong class trip and finds himself involved with an ancient secret unleashing twelve Zodiac magical superpowers. The eighth grader, Steven, has to deal with being a superhero and how that effects him family and friends as he ends up in the middle of a worldwide adventure. With the second book, Steven attempts to keep his allies together as they enter a grey area. Star Darlings is a Disney Publishing multimedia franchise based on an original wish-granting fey people called the Starlings. Star Darlings is a trademark of Star Darlings, LLC. owned by DPW. Barry Waldo was selected to manage the franchise, which is an inspirational brand targeted at tweens designed to: "celebrate their individuality, make positive choices, and turn their wishes into reality". Justice is the franchise's primary retail partner carrying Jakks Pacific doll line, clothing, and books. Disney Stores would carry a limited product line. The Star Darlings plot is about 12 young Starlings at Starling Academy on Starland who learn about Wishworld (Earth) and are selected to go on a secret mission there. Sage, Libby and Leona are the Star Darlings up first for books with the other nine being Adora, Astra, Cassie, Clover, Gemma, Piper, Scarlet, Tessa and Vega. Shana Muldoon first registered a trademark for the Star Darling name in 2009, but it was considered abandoned for lack of use on April 11, 2011. Shana Muldoon Zappa, Ahmet Zappa, and Disney Publishing began development in 2011 on Star Darlings. On March 29, 2013, Star Darlings, LLC filed to register the trademark with two extensions granted with the last given on May 29, 2015. The franchise was announced at the D23 convention in August 2015 and launched on September 15, 2015 with two chapter books Sage and the Journey to Wishworld and Libby and the Class Election. Kirkus Reviews found the first volume, Sage and the Journey to Wishworld, to be "complicated, retrograde, and very sparkly" and for ages seven to eleven. On September 24, 2015, a social media event and a press day would be held for the franchise as part of its launch phase of the marketing campaign. Expected releases through November are the Jakks dolls at Justice, a storytelling and lifestyle app, music through Walt Disney Records and the first episode of a YouTube animated series. In 2016, two animated specials based on Star Darlings were broadcast on Disney Channel, Becoming Star Darlings on January 29 and Star Darlings Friendships on March 25. The TV specials featured a remixed version of the Star Darlings theme song by teen singer-songwriter Skylar Stecker. The remixed theme song was also featured in a music video. Another TV special, The Power of Twelve (22 minutes) was broadcast on Disney Channel on November 26, 2016. The future of this series is unknown as three books that were supposed to be released after Stealing Starlight were canceled, with no new franchise activity after its release on January 17, 2017. However, Shana Muldoon Zappa said on Twitter that there is "an exciting reason" for things being put on hold. Disney Imagicademy is a program of Disney Learning consisting of a suite of mobile learning apps for kids with over thirty apps planned. The first two apps were the parent companion app and Mickey’s Magical Math World on iPad. The parent companion app allows parent to track their kids' advancement on the apps. Hyperion Books for Children (HBC) and Disney Press were both launched in 1990. The Disney Publishing Group was incorporated in January 1992 and included the already formed Hyperion Books, Hyperion Books for Children, Disney Press, and other units. In March 1995 with the market too crowded with Disney books, Hyperion Books for Children merged with Disney Press. Hyperion Books for Children started a new imprint, Jump at the Sun, in September 1998 for the African-American children's market. DPW slated Abadazad four book series from its CrossGen property for publication after purchasing the CrossGen assets under this imprint. ^ "Our Businesses". thewaltdisneycompany.com. The Walt Disney Company. Retrieved May 25, 2012. ^ a b Rainey, James (June 29, 2015). "Disney Merges Its Consumer Products and Interactive Divisions". Variety. Retrieved July 5, 2015. ^ a b c "Corporate Information" (PDF). Disney Publishing Worldwide. Retrieved 2009-03-11. ^ a b Weinman, Sarah (January 28, 2014). "People: Kirshbaum to Join Waxman Leavell, and More". Publishers Lunch. Calder Books. Retrieved March 28, 2016. ^ a b Lodge, Sally (October 8, 2015). "Disney to Launch New Imprint Called Freeform". Publishers Weekly. PWxyz, LLC. Retrieved March 28, 2016. ^ a b c Apodaca, Patrice (April 28, 1994). "Adventures in Magazineland : As a Publisher, Disney Excels at Marketing". Los Angeles Times. Times Mirror Company. Retrieved December 20, 2012. ^ Wein, Len (June 1990). MIckey Mouse Adventures 1. Burbank, CA: Walt Disney Publications, Inc. p. 1. Retrieved March 4, 2015. ^ Mulligan, Thomas S. (September 6, 1991). "Disney Will Keep 'Discover' on the Racks". Los Angeles Times. Times Mirror Company. Retrieved December 20, 2012. ^ a b c "Disney Publishing Worldwide". Entity Information. New York State Department of State. Retrieved December 11, 2012. ^ a b c d e Harris, Kathryn (April 30, 1995). "The Tie-In King : Hyperion Books Rides the Crest of Disney's Successes". Los Angeles Times. Times Mirror Company. Retrieved December 12, 2012. ^ "Company Town Annex: Disney Expands Publishing Offerings". Los Angeles Times. Times Mirror Company. November 22, 1994. Retrieved December 12, 2012. ^ "Company Town : Hollywood Pictures Gets New President". Los Angeles Times. Times Mirror Company. June 14, 1994. Retrieved December 20, 2012. ^ "Disney Publishing Announces Magazine Division Restructuring". PR Newswire. Disney. Retrieved December 20, 2012. ^ McGee, Celia (April 9, 1999). "Grownups Take Hike At Disney". New York Daily News. Daily News L.P. Retrieved December 12, 2012. ^ a b c Holson, Laura M. (August 30, 2004). "A Nike Veteran Adds Some Swoosh to Disney's Tired Mouse". The New York Times. The New York Times Company. Retrieved February 26, 2015. ^ Houston, Lindsey (July 1, 2001). "Einstein makes deal with Disney". Denver Business Journal. American City Business Journals. Retrieved 12 December 2012. ^ "Disney comic books make U.S. comeback". L.A. Biz. American City Business Journals. June 23, 2003. Retrieved 12 December 2012. ^ a b c d "Disney Publishing Acquires CrossGen Assets". ICv2. November 15, 2004. Retrieved March 16, 2015. ^ a b c d e Raugust, Karen (Jan 23, 2014). "Disney Fairies Fly to Little, Brown". Publishers Weekly. PWxyz, LLC. Retrieved March 2, 2015. ^ Freierman, Shelly (January 24, 2006). "Upscale moms target of Disney magazine". International Herald Tribune. The New York Times Company. Archived from the original on April 2, 2015. Retrieved 21 December 2012. ^ "Checker to Publish CrossGen Collections". ICv2. 2006-12-19. Retrieved 2015-03-17. ^ "Disney Restructures Kids Ad Sales, Promos: Merges Units". MediaDailyNews. Feb 6, 2007. Retrieved 20 December 2012. ^ Ives, Nat (August 22, 2007). "Disney Shutters Disney Adventures". Ad Age. Crain Communications. Retrieved May 27, 2016. ^ "Disney launches digital books initiative". Sacramento Business Journal. American City Business Journals. September 29, 2009. Retrieved 12 December 2012. ^ a b Andreeva, Nellie (2019-02-27). "'Book Of Enchantment' TV Series About Disney Villains In Works At Disney+ From Michael Seitzman". Deadline. Retrieved 2019-02-27. ^ "Disney launches comic books in India". Business-standard.com. 2009-04-15. Retrieved 2010-08-21. ^ "Disney inks publishing, distribution pact with India Today Grp". Business Standard. Press Trust of India. December 8, 2010. Retrieved 12 December 2012. ^ Alverson, Brigid (July 15, 2011). "SDCC '11 | Disney to unveil Marvel Press imprint at San Diego". Comic Book Resources. Archived from the original on 2011-08-18. Retrieved 28 September 2011. ^ "Disney Publishing Worldwide Unveils 'FamilyFun Kids'". Wireless News. November 13, 2011. Archived from the original on April 2, 2015. Retrieved 21 December 2012. ^ Preston, Jennifer (January 4, 2012). "Meredith Buys FamilyFun Magazine From Disney". The New York Times. The New York Times Company. Retrieved 19 December 2012. ^ "Disney Publishing Leaving White Plains for California, NYC". Publishing Weekly. April 24, 2012. Retrieved April 11, 2015. ^ "Disney Sells Hyperion Adult Trade List to Hachette". Digital Book World. 2013-06-28. Retrieved 2015-03-01. ^ McMillan, Graeme (April 25, 2014). "Disney, Del Rey to Launch New 'Star Wars' Book Line". The Hollywood Reporter. Prometheus Global Media. Retrieved April 25, 2014. ^ McMillan, Graeme (April 25, 2014). "Lucasfilm Unveils New Plans for 'Star Wars' Expanded Universe". The Hollywood Reporter. Prometheus Global Media. Retrieved April 25, 2014. ^ "The Legendary Star Wars Expanded Universe Turns a New Page". StarWars.com. 2014-04-25. Retrieved 2015-03-03. ^ a b c d e f Richwine, Lisa; Grover, Ronald (August 6, 2014). "Disney toy division's focus on franchises makes it a star". reuters.com. Thomson Reuters. Retrieved August 14, 2014. ^ "Best Sellers: Children's Series". The New York Times Book Review. The New York Times. August 10, 2014. Retrieved March 2, 2015. ^ "Disney launches its first 'Imagicademy' educational app for kids". Guardian News and Media Limited. Retrieved 5 April 2016. ^ a b Ha, Anthony (December 4, 2014). "Disney Will Launch Its First Imagicademy Learning Apps On Dec. 11". TechCrunch. AOL Inc. Retrieved March 2, 2015. ^ "About Us:Disney Publishing Worldwide". disneyconsumerproducts.com. Disney Consumer Products. Retrieved March 2, 2015. ^ a b c d e "Disney rolls out new 'Star Darlings' tween brand". L.A. Biz. American City Business Journals. September 15, 2015. Retrieved September 30, 2015. ^ a b Corbett, Sue (September 13, 2016). "Disney Announces New Rick Riordan Imprint". Publishers Weekly. Retrieved May 2, 2017. ^ Corbett, Sue (April 25, 2017). "Rick Riordan Imprint Acquires First Three Titles". Publishers Weekly. PWxyz, LLC. Retrieved May 2, 2017. ^ Hill, Jim (Aug 9, 2006). ""Disney Dragonkind" roars into stores & "Disney Bunnies" hops onto bookstore shelves in early 2007". Jim Hill Media. Retrieved May 22, 2014. ^ Disney Consumer Products Public Relations (September 26, 2013). "Disney Debuts New Franchise Extension with Launch of Disney Princess Palace Pets App and Toy Line". Marketwatch.com. Business Wire. Retrieved May 22, 2014. ^ "Two 'Abadazad' Volumes Out in June". ICv2. May 1, 2006. Retrieved March 29, 2016. ^ "Marvel Revives Crossgen". ICv2. December 16, 2010. Retrieved March 16, 2015. ^ Bevil, Dewayne (April 1, 2011). "Disney details are key to 'Kingdom Keepers'". Orlando Sentinel. Tribune Publishing. Retrieved 9 April 2014. ^ a b c "Disney Publishing Worldwide to Release Waterfire Saga". Entertainment Close-up. Highbeam. February 2, 2014. Archived from the original on March 29, 2015. Retrieved November 18, 2014. ^ "Jennifer Donnelly, novelist from Lewis County, hits big time with Disney series". Watertown Daily Times. Retrieved 2015-03-01. ^ a b c d e Lodge, Sally (January 22, 2014). "Disney to Launch Multi-Platform Mermaid Saga by Jennifer Donnelly". Publisher Weekly. Retrieved November 18, 2014. ^ a b c Beagle, Ben (March 2, 2014). "Jennifer Donnelly, novelist from Lewis County, hits big time with Disney series". Watertown Daily Times. Retrieved November 18, 2014. ^ Mair, Elizabeth Floyd (January 8, 2015). "Riding the 'Wave' of YA success". Times Union. Hearst Communications. Retrieved June 24, 2016. ^ Beagle, Ben (May 5, 2014). "VIDEOS: A behind-the-scenes look at Tale author's latest". The Daily News. Batavia Newspapers. Retrieved November 20, 2014. ^ a b c d Towers, Andrea (January 23, 2015). "'The Zodiac Legacy': Stan Lee talks about writing his first illustrated novel". Entertainment Weekly. Time Inc. Retrieved February 12, 2016. ^ a b c d Carcione, Dan (January 29, 2016). "New graphic novel by Stan Lee continues epic adventure". KTVI. Tribune Broadcasting. Retrieved February 12, 2016. ^ "Children's Middle Grade Hardcover". The New York Times. The New York Times Company. February 14, 2016. Retrieved February 13, 2016. ^ "The Zodiac Legacy Volume 1: Tiger Island". Preview World. Diamond Comic Distributors, Inc. Retrieved February 12, 2016. ^ Commandeur, Jordan (April 17, 2017). "Stan Lee: 15 Non-Marvel Characters He Created (Or Co-Created)". CBR. Retrieved May 16, 2018. ^ a b Knox, Kelly (September 15, 2015). "'Star Darlings': An Empowering New Series From Disney". Geekmoms.com. Retrieved September 30, 2015. ^ a b c d Milligan, Mercedes (January 26, 2016). "'Star Darlings' Gets Disney TV Debut Friday". Animation Magazine. Retrieved March 28, 2016. ^ a b Foster, Elizabeth (November 25, 2016). "Disney to premiere new Star Darlings special". Kidscreen. Brunico Communications Ltd. Retrieved December 20, 2016. ^ "Star Darlings". musixmatch.com. Retrieved March 28, 2016. ^ Goldman Getzler, Wendy (January 27, 2016). "Disney's Star Darlings tween brand lands on TV". Kidscreen. Retrieved March 28, 2016. ^ a b c Shayon, Sheila (September 17, 2015). "Disney Star Darlings Global Launch Aims to Inspire Tween Girls". Brand Channel. Retrieved September 30, 2015. ^ "Disney Launches New Tween Brand". License! Magazine. Advanstar Communications Inc. September 17, 2015. Retrieved September 30, 2015. ^ "STAR DARLINGS Serial Number:77743585". Trademarkia. April 11, 2011. Retrieved September 30, 2015. ^ a b c Goldman Getzler, Wendy (August 19, 2015). "Disney rolls out multimedia tween brand Star Darlings". Kid Screen. Brunico Communications Ltd. Retrieved September 30, 2015. ^ "STAR DARLINGS Serial Number: 85890995". Trademarkia. April 11, 2011. Retrieved September 30, 2015. ^ "Sage and the Journey to Wishworld". Kirkus Review. Kirkus Media. July 15, 2015. Retrieved September 30, 2015. ^ "Star-Crossed Summer (Cancelled)". Amazon.com. December 15, 2016. Retrieved April 4, 2017. ^ Shana Muldoon Zappa (2017-04-06). "Shana Muldoon Zappa on Twitter: "There is an exciting reason for things on hold!! Stay tuned and thank you!"". Twitter. Retrieved 2017-04-07. ^ "Disney Learning Business Entity Detail: C1779737". Business Search. California State Department of State. Retrieved March 3, 2015. ^ "Entity Information: Disney Learning". Corporation & Business Entity Database. State of New York Department of State's Division of Corporations, State Records and Uniform Commercial Code. Retrieved March 3, 2015. ^ Dawn Wilensky (2015-03-03). "Inside Disney's Imagicademy". Kidscreen. Retrieved 2015-03-13. ^ Angel, Karen (September 7, 1998). "Books and Magazine - Children and Families - Media Talk - High-Profile Authors Turn To Much Younger Readers". The New York Times Company. Retrieved March 1, 2015.